I feel like we hardly need a photoessay this week, since I just posted tons of pepper pictures, but I suppose I have a few other interesting things to share. 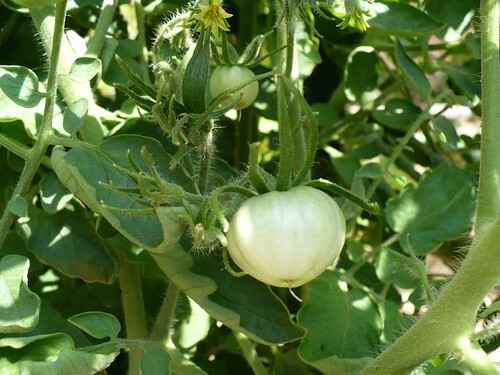 As I was looking at our tomato plants earlier this week, I found that we had a good number of small green tomatoes on some plants, especially the ‘Black Krim’ heirlooms. Some of them are small enough that it seems likely they may have set during this hot spell. If so, that would be very exciting! I chatted with one of our specialists, and the real catch is whether these tomatoes set during the last “cool” spell in June, and they just haven’t grown like they should. I’m suspicious though…we’ll definitely be keeping an eye on them! On another plant, you can just see the tiny little tomato forming where the bloom was. I don’t think these tiny tomatoes are past the point where they will abort if they weren’t adequately pollinated yet, but I know where they are and I’m watching them everyday. Can you just say that I’m desperate for some good news in this hot, hot summer? 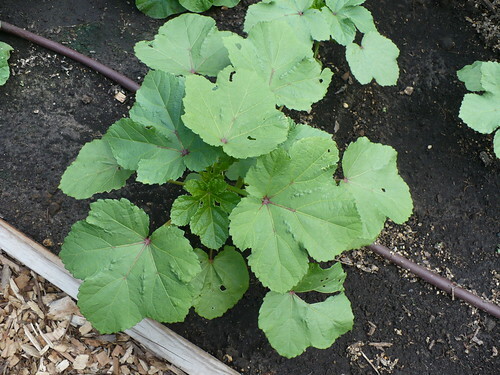 Unlike the tomatoes (and the rest of us) our late okra planting seems to be really enjoying the heat. No blooms or okra yet, but the plants are looking great. 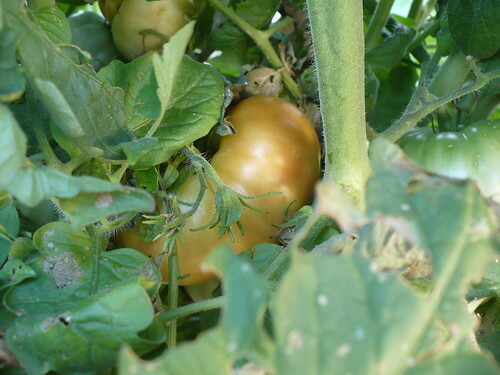 Continuing on the tomato theme, we have had a couple of ‘Marmande’ tomatoes ripen. Or rather, start to ripen. They are currently sitting on my table finishing the process. Speaking of ripening, I think they’re looking pretty good. 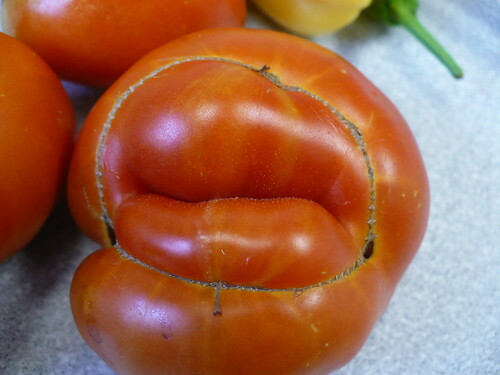 This one is a good candidate for ugliest tomato! 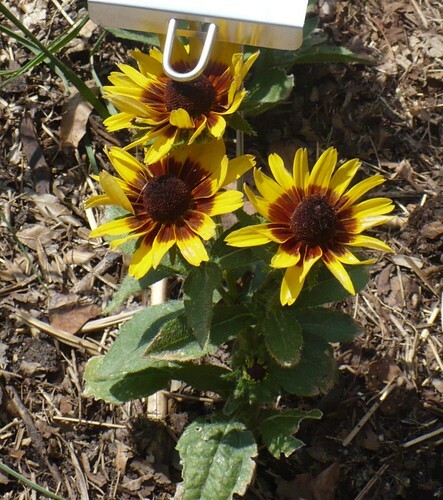 This rudbeckia from the Prairie Star Annual trial has a pretty dinky plant, but the flowers seem to more than make up for it! Next up is the ‘Yummy’ Peppers. We had one plant of these snack peppers last year, and got a whopping 2 peppers off of it, and so far, the 3 plants this year are following right along that pattern. I think we’ve got about 2 peppers on 3 plants. I wish they weren’t so tasty, otherwise I would have completely written them off already. At least it makes you appreciate the cartons for $3.50 in the grocery store! On the other hand, the ‘Piros’ peppers are looking very productive! 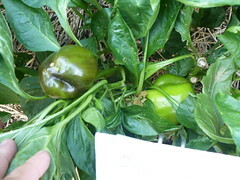 The plants are loaded with peppers, and we’ve had one ripen fully and another is starting to turn red as I write. 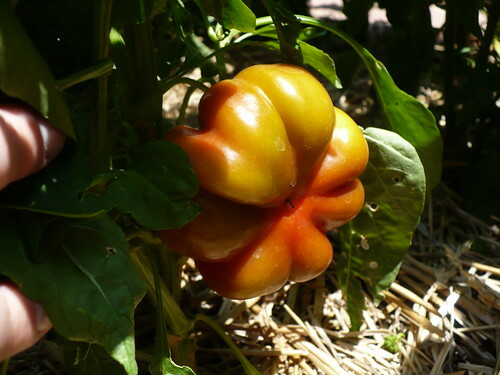 I think this is a hybridized form of an heirloom, which might explain the good yield. The funky shape and the rapidity with which they turn red makes these peppers a lot of fun to have in the garden! in line. While not quite as prolific as the neighboring Piros peppers, they are still setting quite well, and the peppers turn purple pretty quickly. The size of the peppers leaves something to be desired, and it is a bit of a challenge to decide if we should just let the peppers stay on the plants, even though they are already purple, in the hope of getting larger peppers. It seems like the peppers turn purple before they are full-sized. The ‘Bulgarian Carrot’ peppers, which we’ve discussed in previous posts, are also extremely prolific. These are hot peppers – I describe them as being hotter than a jalapeno but not nearly as hot as a habanero. 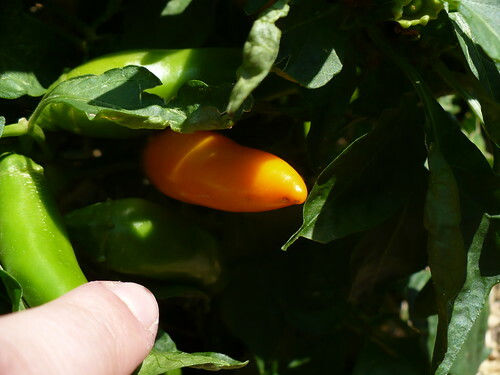 Their shape and size is similar to a jalapeno (maybe not as rounded), but for one difference – they turn a gorgeous bright orange color! Early producing, prolific, colorful, flavorful – what’s not to love about these peppers? 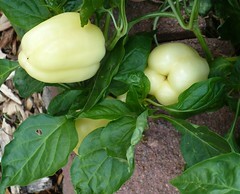 year – the Albino Bullnose peppers. They have been chomping at the bit to produce ever since we planted them this spring. 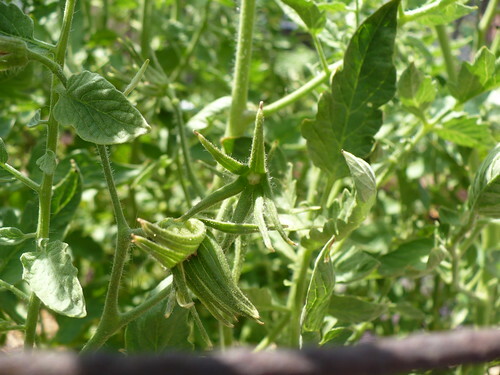 If you remember, I pinched the first set of buds off the plants, because they were trying to flower right after we transplanted them. After that, we just let them go! They have been so consistently loaded with peppers that the plants are now permanently flopped over into the neighboring plants’ space, although the Bulgarian Carrots are doing a good job of holding their own! We certainly have a lot of nice color contrast in the pepper garden, you can’t deny that. Continuing on that theme are the Purple Beauty peppers. 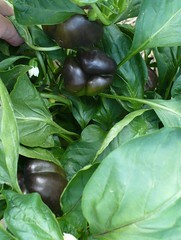 Similar to the Merlot peppers, these are bell peppers that are purple at maturity. Also like the Merlot peppers, they are giving us fits trying to decide when they are ready to pick. The peppers are staying smaller than I think they should be, but that could be due to the weather, lack of fertilizer, too many peppers on the plants, or some other factor. The color is a nice deep, dark purple though. Moving on, we have the Cayenne Blend peppers, which of course, have only shown themselves to be yellow so far. (It seems to work that way – if you plant a “mix” of anything, you end up with predominately one color!) Actually, the one planted in the Family of 4 garden is a dark purple, but otherwise it’s all yellow. 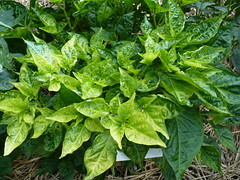 As so far seems to be the case with the hot peppers, these plants are very prolific as well. They were also very early producers, and seem to be hitting a bit of a lag in production right now. I’ve also noticed that the yellow cayennes mature very rapidly, while the purple ones seem to be much slower. There could also be a difference in nutrient levels in the respective beds playing a role in that difference too. Since we apparently love hot peppers, to the point where we grow more than we could possibly ever use, we planted the Yatsufusa peppers again this year. These are Japanese chili peppers which are very similar to Thai chilis in both characteristics and heat. They quickly turn from green to red, and if you let them sit on the plant, they will start to dry, which makes them great candidates for grinding into a homemade chili powder or red pepper flakes. Because we are gluttons for punishment, we planted four of these plants this year. Friends, that is three too many, because one plant produces more peppers than you could ever reasonably expect to consume in a year. 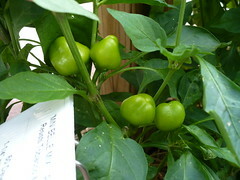 The Sapporo Hot peppers are another reprise from the Asian Garden last year. Slightly larger and slightly milder than the Yatsufusa peppers, they are extremely thin walled and turn red and dry on the plants very quickly. They aren’t quite as prolific as the Yatsufusa peppers either, and maybe not even quite as prolific as the Cayenne peppers (they are actually very similar to cayennes, but perhaps a slightly different flavor profile). However, they are still plenty vigorous for us. 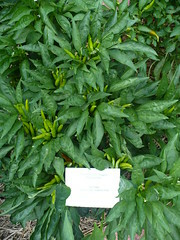 The NuMex Sunrise Chilis are an anaheim type pepper, and are also one of the early producers with a pretty decent yield. They haven’t tolerated the hot sun quite well enough yet to get beautiful yellow chilis out of the deal, because they seem to get sunscald pretty easily. While that is a bit of a downer, we’re not complaining. Pasilla Bajio plants in the center. Now with this next pepper, we may have something to complain about. The Pasilla Bajio peppers are supposedly “mole” type peppers that are hot, chocolate brown at full maturity, and only a little smaller than an anaheim chili. Well, I’ll let you know, I hope. All I can say for sure as of this minute, is that the plants are significantly taller, ganglier, and have fewer leaves per stem than the other peppers in the garden. I have seen a few flowers starting to form here and there, so I’m hopeful that it’s just a late bloomer – literally! the plants are developing this funky, pale, lime green coloration. 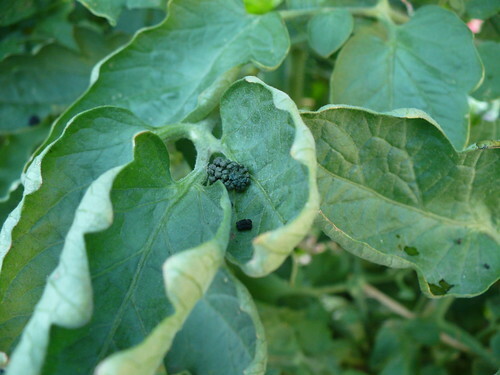 I’m very suspicious that they have contracted a virus somehow – either thanks to the thrips that were giving us problems earlier in the spring, or due to incidental contact with something that could have infected them. It’s possible the seeds were infected, but I would have expected to see symptoms earlier in the year. I’m still hoping for a few peppers (which should be plenty, given how hot they are! ), since they are reputed to be very late producers. Given the amount of hot weather we’ve been having, they shouldn’t be too slow to produce. 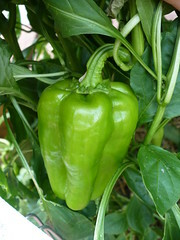 Back on the productive side of things, the New Ace bell peppers are starting to get in gear. Despite being planted 2 weeks after the other bell peppers, they are still doing quite well. The fruit are more of a blocky shape than the Big Bertha peppers, and they aren’t producing a lot, but for the first flush of peppers, it’s respectable. 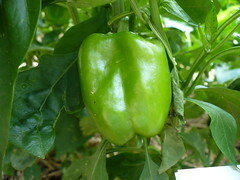 Not quite last, and not quite least, are the King Arthur bell peppers. 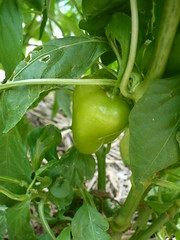 Another green-to-red bell pepper, they were also planted later and we lost one of the three plants. The plants show no signs of flowering, and certainly no signs of producing. Not quite sure what’s up with that! Peppers. Another blend, the peppers aren’t far enough along to know what color they will be. 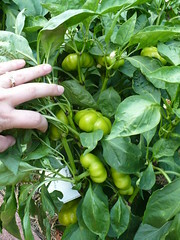 This variety is supposed to produce small, 1 1/2-2 1/2 inch blocky “baby” bell peppers. The plants actually have a surprising number of peppers on them, but they don’t seem to be sizing up very quickly. I’m sure they’ll get there eventually, but not anytime too soon. 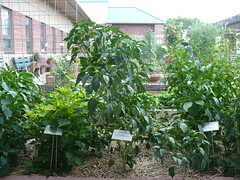 So there you have it – the virtual walkthrough of all 16 pepper varieties in the Demonstration Garden this year. Overall, they are doing very well in this hot, dry summer. There seem to be a few stinkers, but I’m not sure why, in many cases. I think most of them will shape up eventually. (The Yummy peppers and the Chocolate Habanero I’m less optimistic about.) If we do this again, at some point down the road, I think we may want to plant a few less hot peppers, and few more of the interesting types of sweet peppers. I know this just seems funny, given that it’s 110 degrees outside right now – but we’re getting to the time of the year when we plant fall gardens! I know, I know, I’m really funny. Still…if we do get a break in the heat next month, we should get some fall veggies planted. I know it’s kind of difficult to see, because it’s so bright, but there are several branches on this tomato plant that have been reduced to sticks. Something is eating the leaves right off this plant! I spent several minutes searching for the culprit, but couldn’t find anything. This morning we took up the hunt again, and started finding lots of these black piles of caterpillar frass. We must be getting closer! Ah ha! Gotcha! 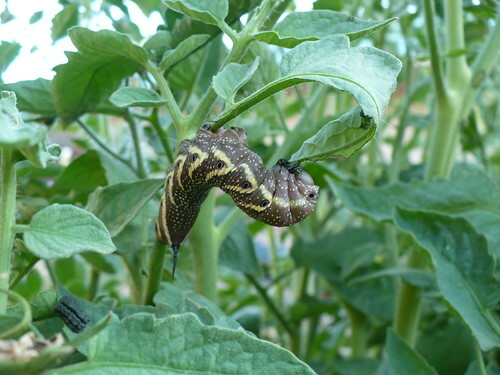 We found this guy hanging out on one of the plants. Isn’t he a cool looking caterpillar? 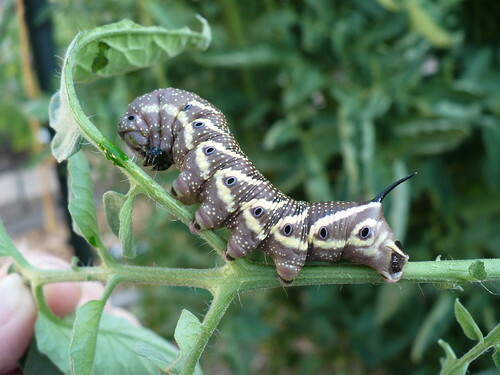 He is definitely some type of Sphinx Moth Caterpillar, although he doesn’t look like a typical Tomato Hornworm, which is green with yellow stripes and a red tail rather than brown with creamy stripes and a black tail. Just one of these caterpillars can be very destructive, but I still think we have another one or two out there somewhere, because we found this one on the south end of the bed, and the other damage is on the north end. The hunt continues! I know this week has been rather light on blogging – for some reason I’ve been busy and not overly inspired! I blame it on the heat. 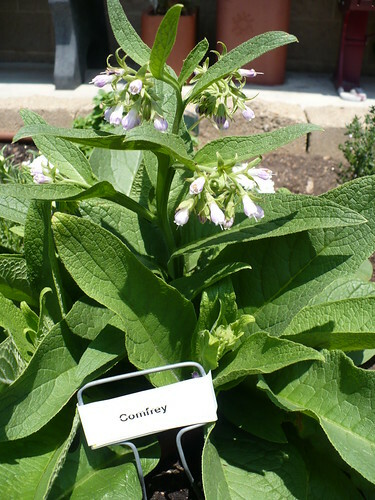 The comfrey in the Herb garden is completely unfazed by the heat. In fact, it looks like something that should be growing in a cool, misty, English countryside. Maybe if I look at the picture long enough, I’ll make myself believe it is cooler. 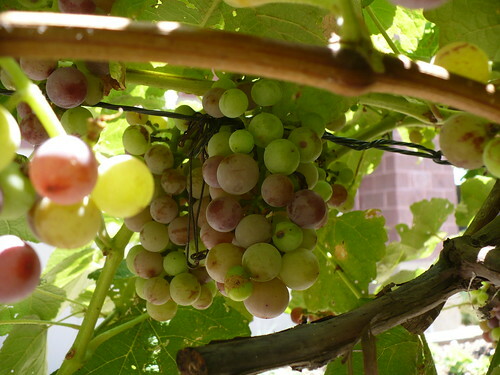 The first grapevine is starting to ripen, but you can tell the heat is doing a number on them too, since the ripening is not at all uniform. 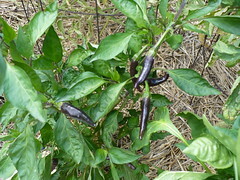 The first ‘Piros’ pepper finally turned color for us. It would probably have gotten a darker red, but I didn’t want to leave it out in the hot sun. The other peppers on these plants are still pretty small, so this was just a lucky, early pepper. 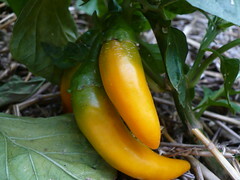 The first of the Bulgarian Carrot heirloom peppers has turned orange. I tried a very tiny nibble…oh boy is it hot! 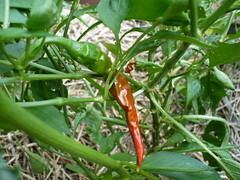 I don’t think it’s quite as hot as a habanero, but it is much hotter than a jalapeno. I haven’t posted this recently, but with all the water restrictions coming in some of our outlying communities, this is a good reminder that it is worse in other places in Kansas. If you want to see something really scary, check out the map of the South, including Texas. I’m seeing articles that estimate $9 billion in agricultural losses in Texas. The one thing I’m surprised about is that the data for the drought boundaries in Kansas didn’t change this week, despite no rain and tons of heat. With that cheery thought, have a great weekend! 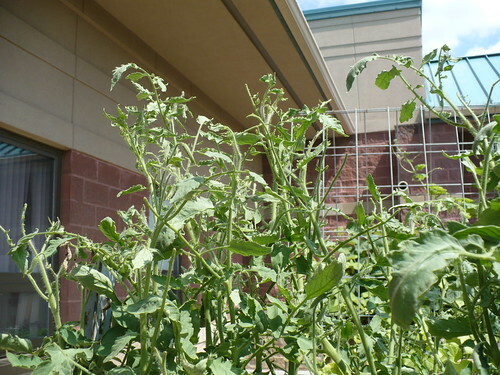 Hope to see you at Tomato Day tomorrow!